There are a great number of good casinos out there, so it’s no surprise why it might be hard to find the absolute best one for you. Therefore we have found a casino that we think suits your preferences. This casino is called Malina. 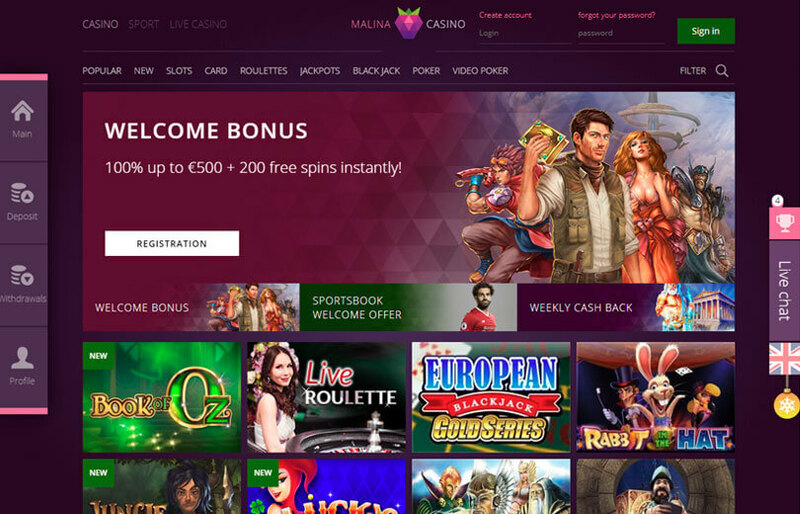 Malina Casino launched in 2016, so it’s a fairly new one in the industry. But, they seem to have gotten a great reputation for themselves during this short period. These days it can be really hard for new casinos to do well because there are so many good ones that have been operating for more than 10 years, which have resulted in loads of experience. There are also casino groups that own more casinos than you can count on your fingers, and almost all of them are well known. This is why we want to give some credit to Malina Casino because they have managed to rise amongst other casino giants. Something Malina Casino can brag about is their website, and after clicking your way there, it won’t take long before you understand why. It has a modern look, and the graphics are extraordinary. The designers have created a simple interface, and this makes it easy for players to browse through the casino. It’s very simple to find promotions that might be interesting, popular games or new ones, check your profile, contact their support team and a lot more. Another thing worth mentioning is that the casino is being operated by Araxio Development N.V. and the website itself is owned by Tranello Group of Companies. Malina is licensed by AntillePhone N.V., and they are being regulated by the government of Curaçao. When it comes to security, the casino has safety measures to make sure transaction details and sensitive information is being kept safe. Random number generator (RNG) is also being used for fair gambling. This is something we think you will appreciate a lot. Like every other casino, Malina offers a welcome bonus for everyone that haven’t created an account yet. Here you will get up to €500 in bonus money when depositing up to €500. This means that the casino will match your deposit 150%. If you deposit €50, you will get €50 in bonus money, if you deposit €100 you’ll get €100 in bonus money, and so on. You will also be able to get a total of 200 free spins. These will be added to your account immediately after accepting the welcome bonus. We are not sure which game these can be used on, because it’s not mentioned by the casino. This might mean that the 200 free spins can be used on whichever game you like, which is a really good thing. But have in mind that it might not be the case, so make sure to read the terms and conditions for the bonus before using it. The smallest amount you can deposit when using the welcome bonus is €10, and the maximum you are allowed to bet is €5. It is very important that you don’t bet higher than this limit, because the bonus is itself and all money won will be voided. Have in mind that the wagering requirement is 30 x bonus money and 30 x the money you deposit. If you want to use the welcome bonus you have to contact their customer support via live chat or email. Normally, you will be able just to click a couple of buttons to use the welcome bonus, so this is a bit unusual. On the other hand, it won’t take long to ask live chat for some sort of bonus code that can be typed in to get it. Remember that the bonuses on offer cannot be combined, so make sure that you use only one at the time. Malina Casino is fully optimised for being played on mobile and on tablets. Even though you can get the best experience on a computer, you still have a lot to look forward to when playing on a small device. The minimum deposit, in general, is also €10, as it is for the welcome bonus. The maximum amount you can deposit is €10,000. Have in mind that the limits might change depending on the payment method you want to use. The withdrawal limit is €50,000 per month, and the pending time for withdrawals is 24 hours. Some of the payment methods you can use for making transactions are EcoPayz, Paysafecard, Visa, MasterCard, Skrill, Enter cash and Neteller. Malina Casino’s customer service can be reached on live chat, phone and email. Their live chat is multilingual, and it’s available 24 hours a day. Malina offers games like Bonanza, Gonzo’s Quest, Penguin City, Vikings go Berzerk, Big Bad Wolf, Wins of Fortune, Great Rhino, Wild Swarm, Northern Sky and Reel Rush. A few more software providers that they have are Yggdrasil Gaming, Betsoft, NetEnt, Endorphina, ELK Studios, Thunderkick, Quickspin and iSoftBet. Activate Your Malina casino Sign-Up Bonus Now! Have you decided if you want to give Malina Casino try? If you’re not sure yet, you should keep reading about their customer service, games and software providers! On the other hand, if you are thinking about going for it, then we really think you should. It won’t take long to find out if this casino fits you or not. As you already know, Malina Casino has a welcome bonus offer for new players, but they also have exciting promotions that can be used no matter if you’re new or regular. Malina has many games, and some of them are coming from providers like Push Gaming, Red Tiger Gaming and Pragmatic Play! They also have several payment methods to insert money into your player account, as well as taking them out after winnings. Ready to activate your sign-up bonus? Click your way to the casino and experience everything it has to offer. And even though it’s possible to play without a welcome bonus, we surely recommend that you take advantage of using it. Good luck! Malina Casino has a beautiful website that is designed in a modern way, and it’s very simple to create an account. They have a welcome bonus for all new players and exciting promotions. You can contact live chat 24/7 and deposit/withdraw money with several payment options. You’ll find many great games here, as well as some of the most innovating software providers in the industry.